What an emotional day Tuesday! I saw my counselor and I cried pretty much the entire 45 minutes. I was eager to receive the call from a medium (I made the appt over a month ago). I know Travis believes in mediums- he would watch them on tv and encourage me to watch with him. I didn’t really believe in them— until after his death. I have now spoke to two different mediums and a spirit worker. Each time I speak to one- my belief deepens. I know with a 100% certainty that Travis is with me and the kids (on a spiritual level). This entry is difficult to write, but I want to keep a diary of what we have been told and what we have experienced. Since Travis died- I have known I wanted to try find a way to connect with him. I researched and researched mediums. I discussed it with my therapist and she gave me a few names. I also emailed a famous medium every day for over a month (with no success). I emailed a medium locally with no success. I was beginning to become more discouraged. Then- a medium from the mpls area finally responded to one of my emails I was so excited and nervous! We spoke to each other over a few months ago- I cried the entire time we talked on the telephone. My heart and mind were overtaken with so much emotion. I wanted to believe the things she said. I wanted to believe that Travis was with us. I left that talk feeling a little comfort- believing that what the children and I thought happened to Travis truly occurred. She told me that Travis was not ready to die, but when his body hit the water- he accepted that he was gonna die. She shared how he was “terribly cold and so disoriented. He flipped the ranger and hit his head”. She told me that he died quickly and peacefully. She shared more- but is it difficult to write- for my heart aches- knowing that he was by himself, all alone and scared. It breaks my heart knowing that he died by himself and I was not there to love him and hold him and tell him how terribly much I loved him. Just a month ago- I had an acquaintance from the area reach out to me. He said that he does not know what to label himself- but calls himself a “spirit worker”. I was so honored and so terribly thankful that this person had the courage to reach out to me, his words gave me much peace and comfort. He shared information that validated that Travis was truly communicating with him. My heart was heavy, not only for the acquaintance, but so full of emotion for what he shared with me. This friend told me that Travis is with us every day. He told me that Travis lays next to me every night and talks to me- yet my mind doesn’t believe its Travis. He was able to give me details of Travis accident that I believe are true. He also told me that Travis died peacefully and is at peace. He spoke about how Travis is persistent and so very encouraging. Travis gave him a nickname “The Whiz” and also frequently shows him an image of a lake with a calming sunset. I know this is Travis- for he was always so encouraging to others- he gave everyone nicknames and we were also looking to purchase a lake home. These are all proof that Travis is communicating with this acquaintance. He said that Travis asked me to look for feathers. Just a few days later- I found a white goose down feather in an afghan that I was using while sitting on the couch with Samantha and Jacob!!! Once again- there is so much more to share. I so look forward to talking to this friend again! I am eager to have our children talk with him as well. Since talking to this gentleman- I have asked Travis every night to talk to me, lay and hold me while I sleep. I ask Travis to please talk to me and let me awake remembering his voice and what we talk about. I know that Travis is always with me for I receive signs. He frequently turns a street light off or on in the early am, while I am traveling to work. Every morning- I talk to Travis while on my way to work- I now watch for the lights- and thank Travis when he turns them off or on. I continually text his phone and talk with him daily. I ask him for advice regarding our children and my life. Even though he is not physically here- I feel his spiritual presence! Just a few days ago- I spoke with an emotional medium. I was soo looking forward to speaking with her! This medium is from Boise, ID. That is where Travis sister, Shosti lives. Many months ago Shosti called me with disbelief. She said her friend (whom does not believe in mediums) saw Crysta. This friend of Shosti’s went with her friends- not knowing what to expect. When Crsyta spoke with shosti’s friend- Crysta spoke of man whom wanted to connect with her. She saw the word “Super” in her connection with this man, she said he was lost for a long time and she saw a body of water. She wanted the friend to know that when he hit the water, he died and his soul left him prior to dieing. She continued to see the name “super” and felt that he was a brother to the friend. The friend did not have a brother- when she heard that the man was missing and died in the water- she immediately knew it was Travis. Travis was Shosti’s brother and his nickname is “super Trav”. This friend has never met Travis. Travis wanted the friend to tell us that he is “OK”, he also wanted to tell us that he has met his unborn “Niece” and she will be the rainbow in our family. Shosti was expecting at the time of this reading and had a baby girl in February!!! Crysta called me this past Wednesday. She told me that she had felt an emotional connection with a male. She said the connection was very strong and was wondering why. I told her about Travis sister- Shosti and how he had spoke to us through Crysta once before. Crysta affirmed my belief that Travis is with us. I am 100% confident that he was communicating to me through Crysta!!! One may ask and doubt- (as my parents and siblings)- but now they also believe! Crysta told me that Travis died peacefully and as soon as he died- he immediately went to our children. She said he went to the light and chose to come back and be with us. She said he is “earth bound” for his spirit chooses to stay with us.She said he was constantly talking about his children and how much he loved his children. She said he wanted to thank me and the children for continuing to talk with him in our daily lives. he was overjoyed with the amount of love we have for him. She said he started to cry when speaking of his love for me and our children. He wanted her to tell me that I was “beautiful and he liked what I did to my hair”. This shocked me!!! For I had recently cut 4-5 inches off my hair just a few days earlier! She said he was tearful when thinking of all that our families, friends and community have done for support me and our children. Travis also told Crysta to tell me to “keep the ring on – never take it off”. 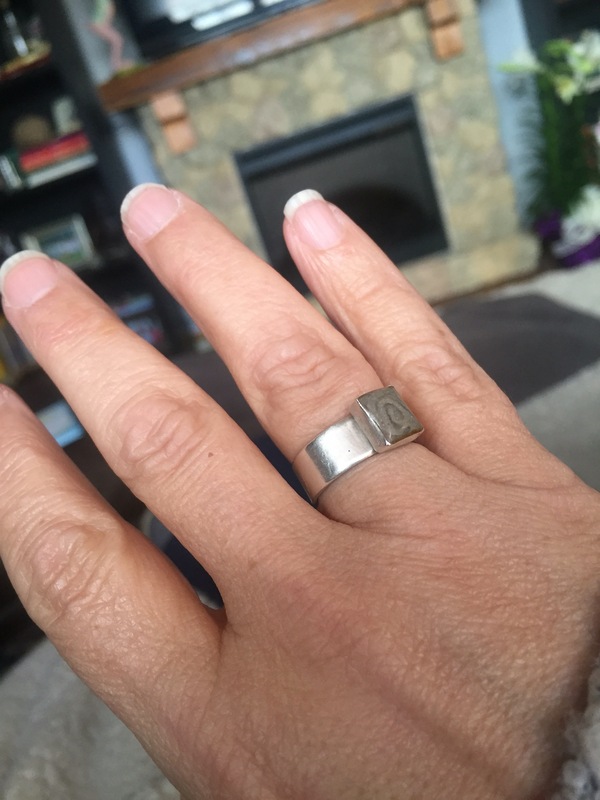 I continue to wear my wedding ring- but I also constantly wear the ring I have created with his ashes. She spoke about how he likes to play with my ring. She asked me to check my ring and the stone with his ashes was pointed toward my pinky. This ring fits snug- for when I had the ring made and sized- I had not eaten for days following his death. Crysta said Travis told me to not worry about putting all his items away. I have not been able to move anything. His shampoo and body wash are still in our shower. His clothes he wore prior to going missing are still sitting on the chair in our bedroom. She said he loves all the photos we had of him (we had numerous tag boards at his funeral of hundreds and hundreds of photos). She said she sees many photos with him grinning and making funny faces(that is SOOO Travis)! He also told her that he is sorry that I have some “big shoes to fill” and he was laughing sarcastically. He told her that I am right in keeping all the hunting stuff- for that is for our family, and I now may have to be more active in hunting. I told her to let him know that I am signed up with Jacob to take hunters safety with Jacob next week. She said he smiled. She said that he then laughed and asked that I “keep the hunting items in their spot”. She said he likes his garage nice and organized and wants the items put where they belong and “organize the garage” as it should be. This is SOOOOO Travis! His garage was his mancave! I have not been able to move things. The garage is a difficult area for me. Travis had everything just right. He had his goose hunting bag still packed with snickers- watchamacollit, string cheese…..for he was going hunting again. I have not had the strength to touch it. Crysta said that Travis wanted me to know that he will continue to help me parent. He will never leave my side. He terribly misses the physical aspects of our relationship, but he will always be with me and the children. He will guide me and the children. She said he is a “loud Spirit” and she knows with 100% certainty that he will always be with us. She said the he is getting good at sending signs and he loves electricity. I told her about the street lights. She said he likes to play with car radios. I then told her that he has done that to Sydney. She said he wanted me to tell the children to look for pennies and pay particular attention to the dates on the pennies. She said if we think we had a sign- she is 100% sure it is Travis. She said that his death happened fast and he said it was ok that it took a few days to find him. She said he died very peacefully and when he did die- he immediately came to us and was searching for his children. She then asked if I had a young son who was constantly playing video games in the basement! Since travis death- jacob has been in the basement playing video games (sitting on the couch he and Travis picked out a month prior to Travis death and using Travis brand new large screen tv). She said that Travis wants me to know that its ok to let Jacob play the long hours of video games- for it is helping him and he will be ok. Travis wants me to know that Jacob is holding his emotions in- but he will be ok. Ask for more help- stop saying “I’m OK or I’m fine”. Travis said he was just as quilty. He was so happy that my family was there to help me and the kids. He told me that my dads health will also be “OK”. He became tearful again knowing that we have so much support. Travis was very happy that a “Brother or Brother in law” was guiding our children and that Travis would guide that brother-in law. He knows that the brother-in-law will help the children for he has been through it! Travis wants me to cherish the blanket made of “squares”. My grandma marion made us a quilt for our wedding. I asked Crysta if he meant the camoflauge pink blanket travis bought for me last summer (I hated it) and now I sleep with it or his fuzzy camoflauge blanket every night on the couch. She said he smiled and said “I told you so”!!!! Crysta then asked me if I have a picture of Travis and myself above our bed- WE DO!!! She said that Travis likes to play with it and move it every so slightly. I immediately looked and our wedding photo was no longer straight!!!! Crysta spoke about how Travis is with us at all times and he was excited for he could be with us 24 hours a day- for he didn’t have to sleep. “He can be with the oldest in college, Jacob in middle school and you all at the same time- for there is no such thing as time where he is at”. I remember Travis always saying that sleeping and eating are a waste of time. She said his spirit continues to do his daily routine, shower- brushes teeth, makes coffee. She said if we hear something- it most likely is Travis. Travis also wanted me to know that the “car is ok”. I at first spoke about how we sold Travis pickup just a few weeks ago and she said that he responded that that was the right thing to do but that is not what he was talking about. I then thought of Samantha’s new vehicle that I purchased in February. I told her that Travis and Samantha were looking for a first vehicle prior to his death. I told her that when I was looking at the one we purchased- I would constantly talk to Travis and try listen or hear what he would tell me. She said that Travis then smiled and said- the vehicle was a good choice. Crysta continued to tell me that Travis spoke of his love for me and our children. She continued to tell me that he wants us to know that he will always be with us and he will be the first one I meet when I die (but it wont be for a very long time). Travis wanted me to know that it is “Tight on the couch”. I have not been able to sleep in our bed and have been sleeping on the couch or Sydneys bed since the funeral!!!!!!! I asked her to ask Travis if I should move back to our bed and his response “baby steps”. Travis wanted the children to “pay attention to their dreams”.know that he is a very strong spirit and that he will always be with us and we will be OK. His energy is “amazing” and he loves us so very much. Crysta spoke of many actual events or physical things that are within our lives :my recent haircut, the couch,the wedding photo above our bed, Samanthas new vehicle, my ring, jacob playing video games, my fathers health, my brother in law helping the kids. SOOO MANY valid – visual examples. How could it not be Travis? I believe her 100% and now know that Travis can talk with us and HE IS HERE WITH US ALL THE TIME!